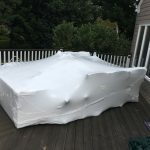 When the weather doesn’t cooperate with your project, shrink wrapping is the answer. NYC Shrink Wrapping encases your scaffolding in weather-proof wrapping to ensure that the work continues as scheduled regardless of the weather conditions. NYC Shrink Wrapping can help control the climate of your building project during cold months and harsh weather. The work must go on no matter what the conditions are, and NYC Shrink Wrapping is the answer.